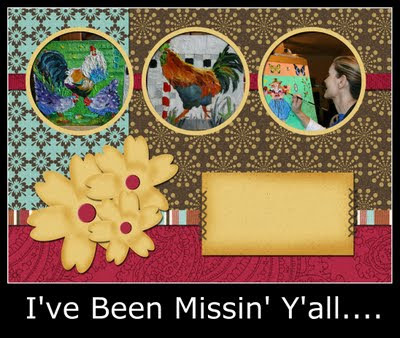 Dimples & Dragonflies Studio & Gallery LLC: "Inexplicable Impulses"
Dearest Friends ~ I Realize I've Been Absent For A Few Postings Now, And I Wanted To Update Y'all And Express How Much I've Been Missin' Everyone. Also Wanted To Take A Moment To Share A Lit'l Of What I've Been Up To. A Few Weeks Past I Had This Inexplicable Impulse To Begin Work On A Large Scale 48X60 Canvas. I'm Almost Embarrassed To Tell Y'all That This Piece Has Truly Become An Obsession Of Sorts. I Know In A Previous Post I Was Shouting How I Was Gearing Up To Begin Work On A Farmyard Series..And True To My Word I Have In Fact Moved Some Paint Around On A Few More Panels Within That Series..But Primarily I've Been Focusing On This Current Larger Piece. In The Next Few Days I'll Be Posting Some Photos Of The Smaller Panels I've Completed And Try And Give A Peek At The New Large Scale Composition That's Preoccupied My Life So Seriously Of Late. Sending Some Love To Each Of You Along With Hugs Of Warm Georgia Sunshine! Looking forward to seeing what you've been working on. I am really anxious to see what you are currently working on. I know it will be something very special indeed!! 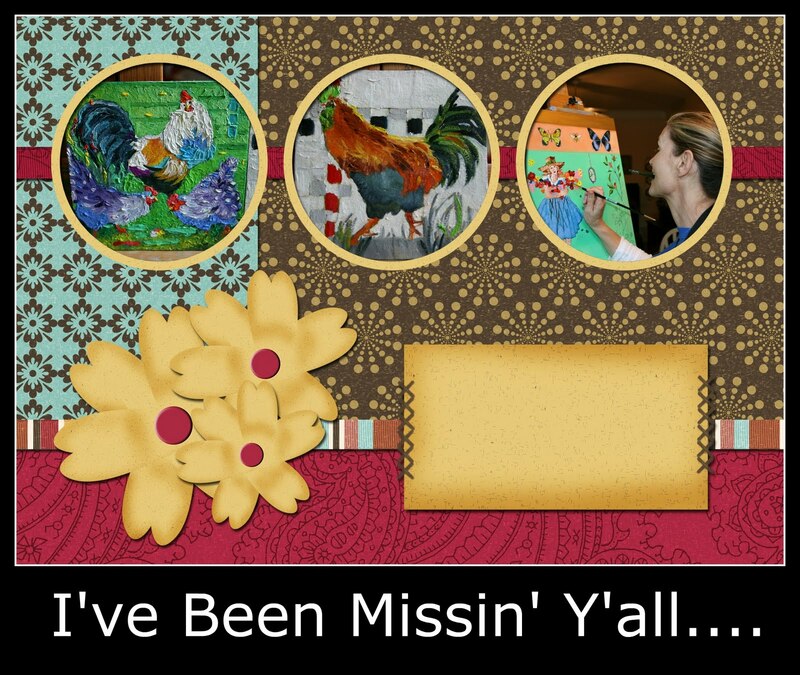 love with your "Rooster Series" and look forward to seeing them in their completion! Today the temps here in Georgia are refreshing, don't you think so too? P.S. Come on over and sign up for my B-Day Giveaway ok? Hi Teri, I have been away too and just getting back into the swing of things. I firmly believe that "inexplicable impulses" should be honored... and I'm pretty sure you do too because I have seen you do it in the past. I have faith in you, my friend, that the results will confirm your decision to "go with it"!! Hi Terri! So good to see you back--48 x 60--wow!--is all I can say--I know it will be superb--can't wait! Ummm! Looking forward to see that huge work! For sure it will be amazing.